They seems had enjoyed their sumptuous lunch at the comfort of the car trunk. We drove 45 minutes to Red Rock Canyon with empty stomach as we were all excited to see the place. We stopped by at the Mexican restaurant to take out some foods to eat during the trip. There's the kids did not mind the heat and just enjoying their foods. We were supposed to rent a car or van but it was a bit expensive renting a car in Las Vegas. Good thing my BIL decided not to take the car to work instead he asked his wife to dropped him off to the airport. However, compared to car hire australia, in case you do not know that they have affordable rate and amazing services. Australia is one amazing place that lots of people including myself wants to explore and discover. If Australia is in your next travel plan then book cheap car hire in Australia as the convenient way to roam around the place. It's easy and convenient and wherever you fly in to, there’ll be a car waiting for you. We know how important and convenient a car when traveling. You don't have to wait long hour for taxi cab and you feel comfortable as well. great tsang... u have been there with kids. I want to bring my upaw there one day. Bringing up food during the trip is smart and perfect! would love to visit australia too! 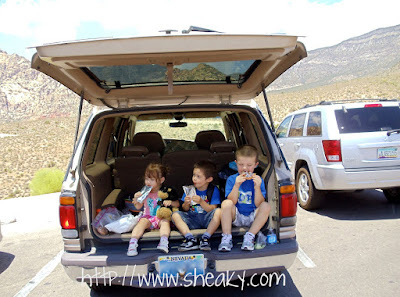 the kids looked cozy in that space back in the car and the hatch back's door gave them shade out from the sun. Must be beautiful view there in Red Rock canyon. I wish our family can visit it someday. renting cars must be handy when visiting other places in US and Australia too. they look cozy indeed despite the heat...so cute! I would love to visit Australia someday.